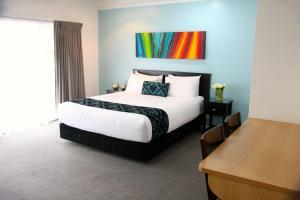 Located in Hamilton’s city centre and less than 500 metres from Waikato Stadium, the Aquarius Motor Inn offers self-contained units with free Wi-Fi access. It offers an indoor swimming pool. 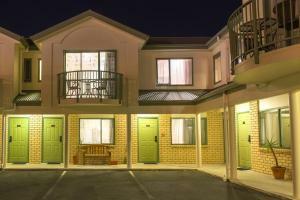 This motel features light and airy rooms with full cooking facilities, including microwave and refrigerator. All units come with a private bathroom equipped with a hairdryer. All units include heaters ( and fans in Summer) to ensure guest comfort year round. All rooms include satellite TV with 50+ channels. Guests at the Aquarius Motor Inn can benefit from barbecue facilities on the property. On request, a continental breakfast can be arranged and served to your room. The studios and suites are daily serviced. Free parking available in available on the property. When would you like to stay at Aquarius Motor Inn ? This studio features a TV and a well-equipped kitchenette with a microwave and refrigerator. It does not have tables or chairs. Features a separate lounge area and a fully-equipped kitchen. Large two-bedroom apartment split over two levels. Combined lounge/kichen downstairs and the bedrooms and bathroom upstairs. This well-appointed and spacious studio includes a coffee machine and a deep bath as well as a separate lounge room. Located on the higher levels, this spacious room includes a sofa bed in the lounge area. There is also a kitchenette with 2 stove-tops, microwave, kitchenware and an en suite bathroom.Please note that this room is only accessible by stairs. Guests are required to show a photo identification and credit card upon check-in. Please note that all Special Requests are subject to availability and additional charges may apply. Please inform Aquarius Motor Inn in advance of your expected arrival time. You can use the Special Requests box when booking, or contact the property directly with the contact details provided in your confirmation. Please note for guests not paying by credit card, this property requires a refundable bond of one night accommodation upon check in to cover any incidental charges. Each day we'll check prices and send you an email for your selected dates at Aquarius Motor Inn. If you don't have specific dates but would like to check prices for say next weekend or say next month we can check the price too. Click to write a review and share your experience of Aquarius Motor Inn with other travellers.